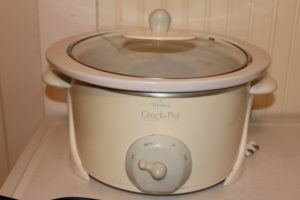 In yesterday’s blog, I described my first slow cooker, a 1970s K-mart model that my mother gave me. I have lots of slow cookers, used for various meals. The second slow cooker was the genuine article-a real Crock-Pot. It is a white 6-quart round one that works perfectly for stews, soups and smaller roasts. I can’t begin to tell you the number of meals I’ve made in this Crock-Pot-beef stew, chili, French onion soup, Greek chicken, the works. When I bartended at the Elks Club years ago, I worked Monday nights which of course means football during the season. Back then, there weren’t a lot of patrons, so I decided to offer some simple meals mentioned above to those who wanted a free meal, along with making dinner for myself. It was a hit! I think this is what made my Jamey fall in love with me-he was a regular patron and always ate what he took! My second Crock-Pot. We’ve had a lot of adventures together over the years!